THIS IS WHERE WE CAN TRADE RECIPES! IF YOU HAVE A RECIPE YOU JUST LOVE AND WOULD LIKE TO SHARE, JUST E-MAIL ME YOUR RECIPE. I WOULD LIKE ANY RECIPES THAT INCLUDE HOMEGROWN FRUITS. ON THIS PAGE, I WILL ALSO INCLUDE MY JAM RECIPES AND HELPFUL HINTS FOR CANNING AND FREEZING. In 4-6 qauart kettle of Dutch oven, combine sugar, water, vinegar, cinnamon, and whole cloves. Heat syrup to boiling; keep hot but not boiling. 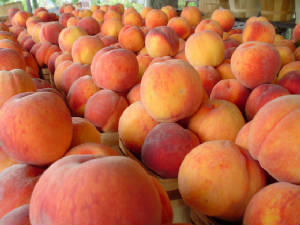 Wash peaches, peel, halve, and pit. To prevent discloration, add the peach halves to syrup as soon as they are cut. Heat peaches in hot syrup 5 minutes. Pack fruit and syrup into hot jars, leaving 1/2 inch headspace. Adjust lids. Process in boiling water bath (pints) 20 minutes. In 8-10 quart kettle or Dutch oven, mix peaches and cantalope. Bring mixture to full rollig boil; stir constantly. Add sugar and lemon juice. Bring mixture again to a full rolling boil. Boil, uncovered, 12 minutes. Add the slivered blanched almonds, nutmet, salt, and grated orange peel. Boil hard, uncovered, till wyrup sheets off metal spoon, 4-5 minutes. Remove from heat; quickly skim off foam with metal spoon. Pour at once into hot, steralized jars; seal. Peel, core, and grind or finely chop pears; measure 2 cups. Peel, pit and grind or finely chop peaches; measure 2 cups. In 8-10 quart kettle or Dutch oven, combine pears, peaches, lemon juice and pectin. Bring mixture to full boil. Stir in sugar. Bring again to full rolling boil. Boil hard, uncovered, 1 minute, stirring constantly. Remove from heat; quickly skim off foam with metal spoon. Pour at once into hot steralized jars; seal. Sort, wash, remove stems, and pit cherries; Measure 3 cups. Cut up cherries. In 8-10 quart kettle or Dutch oven, combine cherries and 1/4 cup water. Bring to a boil. Cover, simmer 15 minutes. Stir in sugar and juice. Mix well. Bring mixture to full rolling boil, stirring constantly. Boil, uncovered, till thick, 7-10 minutes. Remove from heat. Quickly skim off foam with metal spoon. Pour at once into hot sterilized jars. Seal. Wash and hull 6 pints of strawberries. Put strawberries in blender container to mash; blend thoroughly. In 8-10 quart kettle or Dutch oven, combine strawberries and 7 cups of sugar. Heat to full boil; reduce heat. Boil gently 10 minutes. Strain juice through jelly bag; drain several hours or overnight. Return juice to kettle and heat. Pour hot syrup into hot jars, leaving 1/2 inch headspace. Adjust lids. Process in boiling water bath (half-pints) 10 minutes. Dissolve Jello in hot water. Add sugar, salt & lemon juice. Chill until slightly thickened. Add crushed strawberries and then fold in whipped cream. Turn into baked pie shell. Chill until firm and garnish with whole strawberries. Combine sugar, cream, corn syrup & butter in sauce pan. Bring to a boil for 1 minutes. remove from hear. Stir in candy bar. Cool, stirring occassionally. Serve fresh strawberries topped with sour cream and toffee suace. Stir in Strawberries. Pour into 9 inch pie shell. 1. Wash and rinse 1-2 cup size plastic containers with tight fitting lids. 2. Prepare fruit - Discard stems and crush strawberries. 3. Measure EXACT amount of prepared fruit into a large bowl. 5. Stir sugar into prepared fruit. Mix well. Let stand 10 minutes, stir occassionally. 6. Stir 1 box pectin and 3/4 cup of water in a small saucepan. (Pectin may start out lumpy). Bring to a boil on high heat, stirring constantly. Boil 1 minute, stirring constantly. remove from heat. 7. Stir pectin mixture into fruit mixture. Stir constantly until sugar is completely dissolved and no longer grainy, about 3 minutes. 9. Let stand at room temperature for 24 hours until set. Refrigerate up to 3 weeks or store in freezer up to 1 year. Let thaw in fridge. Few drops of red food coloring if desired. In food processor with metal blade or in a small bowl, crush 1/2 cup of the strawberries; beat in cream cheese. Spread strawberry cream cheese mixture thickly on one half of the bread slices and top with the others. In medium mixing bowl, beat together egg substitutes, milk and vanilla. Pour mixture into 9 x 13" baking dish. Put strawberry-filled "sandwiches" in pan, making sure both sides are covered with egg mixture. Cover and refrigerate overnight. Slice the remaining strawberries and combine with sugar and orange juice in medium saucepan. Simmer, stirring constantly, over medium heat until strawberries are slightly cooked and sauce is thickened. Remove from heat. Add red food coloring if desired. Chill overnight. Transfer the sandwiches to a greased cookie sheet. Bake in preheated oven at 375 degrees for 25 minutes or until golden brown. Serve with warmed Strawberry Sauce. HERE ARE TWO SAMPLE RECIPES FROM THE COOKBOOK. IN A LARGE DECORATIVE BOWL, GENTLY TOSS PINEAPPLE, RASPBERRRIES, BLUEBERRIES, STRAWBERRIES AND MELON BALLS. IF DESIRED, DRIZZLE WITH GINGER LIME DRESSING. COMBINE HONEY, ORANGE JUICE, LIME JUICE, CRYSTALLIZED GINGER AND LIME PEEL WELL. MAKES ALMOST 3/4 CUP. To find our apple recipes, please click this link. Wash and pit 3 pounds of red plums. Put through food chopper, using coarse blade; measure 5 cups. Add 4 cups sugar; let stand 1 hour. Boil hard, uncovered till syrup sheets off metal spoon, 8 minutes. Remove from heat; quickly skim off foam. Pour at once into hot steralized jars; seal. Cream together butter and sugar until fluffy. Add eggs one at a time, beating well after each addition. Sift together flour, baking powder, baking soda and salt. Add to creamed mixture, alternating with the sour cream. Gently stir in vanilla, cardamom and applesauce. Combine blueberries, brown sugar ad 1 Tbl flour. Pour half the batter into a well-greased and lightly floured 13x9x2" baking pan. Bake in 350 degree oven 35-40 minutes or until done. Sift together flour, baking powder and salt. Cream butter and sugar and beat in egg. Add flour mixture and milk. Stir until dry ingredients are dampened. fold in Blueberries. Turn into 9-inch square cake pan. Sprinkle with topping (see below). Bake in preheated oven at 325 degrees until tester comes out dry, 45-50 minutes. Loosen adges; let cool partly. Cut into squares in pan and serve warm. Mix until mixture looks like coarse crumbs. Soften cream cheese: spread in bottom of cooked pie shell. Fill with 3 cups of Blueberries. Combine 1 cup Blueberries with water. Bring to boil, reduce heat and simmer 2 minutes. Strain and reserve juice. Cook, stirring constantly until thick and clear. Cool slightly, then add lemon juice. Pour over berries in pie shell. Chill. Serve with whipped cream. Combine rum, triple sec, blueberry syrup and lemon juice. Put in a shaker and shake well. Fill a large glass half full of ice, add drink and fill to the top with club soda. Add a slice of lemon and gloat the blueberries. Cream sugar, eggs adn margarine. 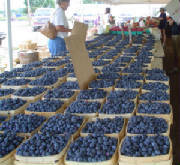 Combine remaining ingredients, but fold Blueberries in last. Bake at 375 degrees for 20-25 minutes. Mix graham crackers and butter; pat into 9 x 13 in pan. Mix Jello, boiling water and lemon juice. Chill, then whip. Chill the condensed milk until partly frozen, then whip until thick. Add the vanilla, cream cheese and sugar. Fold into whipped Jello. Pour over crumbs and chill. Blend the Danish pudding with cold water and berry juice; boil until clear. Cool and add raspberries. Spread over cheesecake. Mix and spread in a 9 x 13 in pan. Bake at 350 degrees for 10-15 minutes. Heat milk and add marshmellows until softened. cool and add whipped cream and fruit; pour into crust. Chill at least 2 hours and serve.